Sports Labs in conjunction with Strathclyde University focused on one of the draw backs of the Lisport test which is the simulation of maintenance of the surface under test. The Lisport involves assessing the wear of artificial turf by simulating extended periods of use. One of the major short comings of this test is that it does not take into account maintenance which is performed on artificial turf and the effects this has on the wear of the turf over time. Therefore the aim of this project was to implement maintenance procedures into the Lisport. These will include brushing, which levels the infill and tining, which helps to prevent compaction of the infill. The final solution will aim to be fully automated in order to limit the technician time required for the operation. 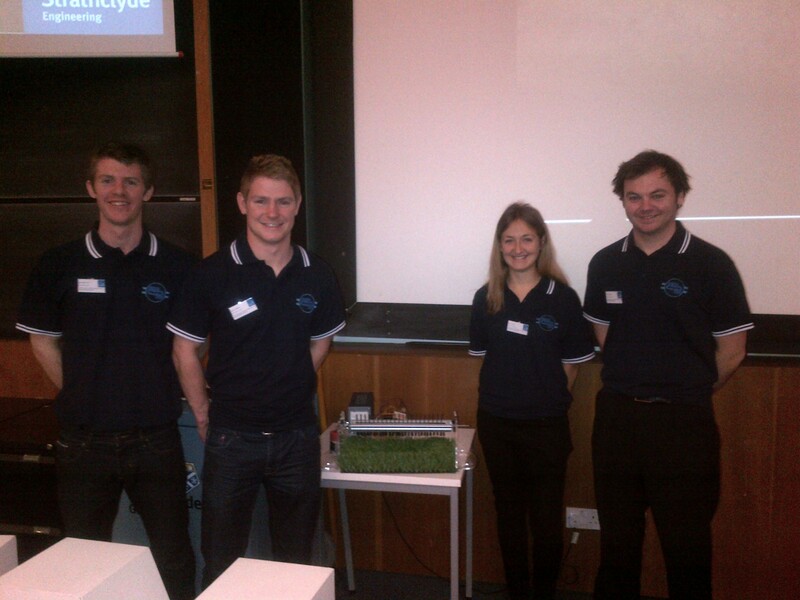 Here we have the student group who carried out the Lisport research. Infill Splash Research Sports Labs in conjunction with Napier University in Edinburgh have been researching the issue of infill [rubber] splash in 3G Football Turf systems. The purpose of the research was to produce a test method to assess the infill splash of filled 3G systems. The test should be able to measure the splash and rank systems in terms of low to high degrees of splash and characterize the splash in terms of the issues this may cause to television viewing. The test was set up to look at ball/surface interaction and not player surface interaction, the theory being that the ball surface test may to some extent simply identify systems prone to splash whether ball or person interface is the mode of impact. This assumption as yet has not been tested by Sports Labs and may form the subject of further future research. As with all research projects, this tends to pose more questions some of these questions will be discussed in the coming weeks. The amount of free pile (pile exposed above the infill) affects the amount of infill splash, high values of free pile reduces infill splash. A firm substrates [stone, asphalt] does reduces infill splash, shock pads in a direct comparison increase infill splash values. A thatch pile within an artificial turf does not reduce infill splash. Pile density does influence infill splash; higher density artificial turf does influence infill splash positively. Green coloured infill is less obtrusive then black SBR when filmed under test. The grading and shape of the infill does not appear to influence the degree of infill splash. 40mm pile height artificial turf appears to have high infill splash values. Clearly it would be useful to test systems which purport to be low splash in the next phase of the study. Also it would be helpful to have other Labs to use the test to assess inter Laboratory reproducibility following on from this. We will make some improvements to the test when it is introduced to the Lab for general evaluation again these will be discussed in the coming weeks.